1. 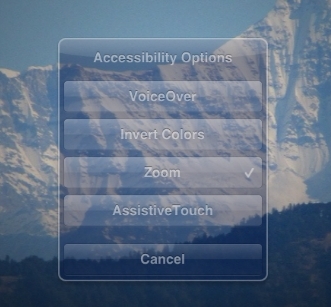 Ensure that Zoom is turned on in the Accessibility settings. 2. As an alternative to double-clicking with three fingers, Zoom can be activated by triple-clicking the home button. This must be turned on in Accessibility settings under Triple-click. 3. If triple-clicking the home button has been set for more than one function, a choice is offered after triple-clicking the home button.